Originally, Final Fantasy IV was released in the US as Final Fantasy II and Final Fantasy VI was released as Final Fantasy III. The reason for this odd nomenclature was that Final Fantasy II, III, and V had not been released in the United States. Why not? Final Fantasy V was so popular in Japan that Japanese authorities asked that it be released on a weekend so as to prevent children from skipping school. Why were Final Fantasy II and III, games that were partially created in the United States, not released here until many years later, and never for the systems they were originally designed for? It’s a running theme that Japan believes these games too esoteric, too inaccessible, for the western gamer. Sometimes they are right. There are always the tales of jRPGs that fail miserably. The PS1 was saturated with jRPGs. Some sold, some did not. The Suikoden series, although a cult fan favorite, was eventually discontinued in the west, with the latest entry Japanese only. It wasn’t just jRPGs though. Kotaku has a whole list of Japanese only games. So what does the Western gamer do if s/he wants to play these games? Prior to this gen, the sole choice was to sit and weep quietly in a corner. The PlayStation Vita has been out for two months in Japan. So how is a PSP game topping the charts? The Nintendo Wii, the little console that could, saw a bevy of fantastic games. One area that it lacked in was jRPGs. This was especially true of the West where some of the best were not being localized. Three particular titles of interest were Xenoblade Chronicles, The Last Story and Pandora's Tower. These were high quality, much lusted over jRPGs that Western gamers wanted to see imported. Really. Wanted. Something pretty incredible and game changing happened. Gamers organized. Not in a “let’s write some angry letters” kind of way, although that is how it started. This was a grassroots, we’re not going home until the game is released or we collapse from dehydration, total mobilization of Wii owners. Ironically, on the above link, the first comment reads, “If you can tell me at least one time that this has ever work(sic) I'll do it. Seriously.” The second reads, “It's no use. Besides, Xenoblade is already confirmed.” Xenoblade having been confirmed for EU. They were right. This wasn’t the first time that gamers had tried very hard to bring over a much beloved game. And those Earthbound fans are…WEIRD. So what was different this time? The landscape had changed. Petition sites existed, social media was booming, and perhaps most importantly…Amazon.com was a major player in video game sales. Pre orders for Xenoblade chronicles were enough to send it to the #1 spot for a day. Nintendo could no longer sit by idly and think this would blow over. They reacted. 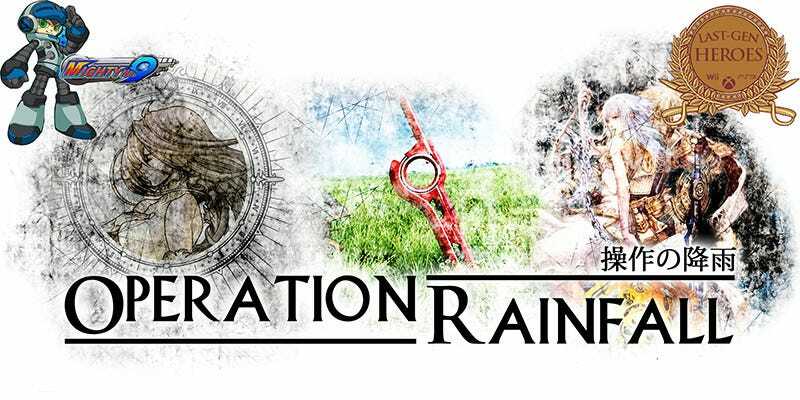 While it’s impossible to say that the decision was ultimately due to Operation Rainfall, the noise created could not be ignored, and for once it seemed that maybe gamers did hold some sway. From these seeds an idea was born. Although not a new concept, crowdfunding really began to have its heyday during this gen of consoles. This was a way for gamers to really vote with their wallets. Although gamers may continue to vote unwisely, they now have the power via sites like Kickstarter and Steam Greenlight to say which games can and cannot see the light of day. So, while Megaman Legends 3 may have been cancelled, Mighty #9 is coming to a PS3, PS Vita, PS4, Xbox One, Wii U, Nintendo 3DS, and Xbox 360, thanks to the 3.8 million dollar donations from fans. So, for this generation, the real winner has been, and will continue to be, the gamer. Gamers have shown that they’re not content to sit around waiting for a game they like, and have taken to the proverbial streets to let their voices be heard. Nothing else can compare in terms of just how profoundly the face of gaming has changed going into the future. So pat yourself on the back, dear reader. You’ve got the power!